Both the House and Senate proposed base budgets Monday that will not restore large cuts made to public education in 2011. Republican leaders in both chambers of the Legislature on Monday offered spare first drafts of the state’s next two-year budget that continue $5.4 billion in cuts to public education made last session and freeze funding for an embattled state agency set up to find a cure for cancer. 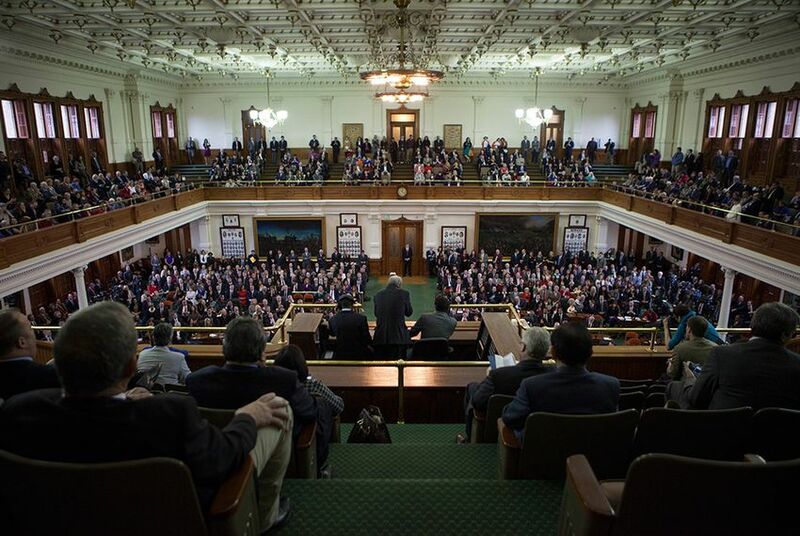 Upending recent tradition, the Texas Senate is starting off with the leaner budget this session, one that’s about $1 billion smaller than the House budget but spends nearly the same amount in general revenue, the portion of the budget that lawmakers have the most control over. General revenue typically makes up around half of the total budget, with much of the remainder coming from federal funding. The Senate proposed a $186.8 billion budget, a 1.6 percent drop from $189.9 billion, the amount the current budget is estimated to grow to after lawmakers pay for some unpaid bills in the current budget this session. General revenue spending makes up $89 billion of the budget, up 1.5 percent from the current budget. The total House budget will be $187.7 billion, down 1.2 percent from the current budget. General revenue spending makes up $89.2 billion, a 2 percent increase from the current budget. Both proposals drew swift criticism from Democrats and education groups, but Republican lawmakers in both chambers stressed that the budgets are merely starting points. The budget process picked up steam last week when Comptroller Susan Combs announced that Texas had $101.4 billion available in general revenue and $11.8 billion in the Rainy Day Fund. Both the House and Senate proposals leave the Rainy Day Fund untouched. The Center for Public Policy Priorities, a liberal think tank in Austin, has said the state needs to spend $96 billion in general revenue to keep state services at the current level and $108 billion to restore the cuts from the last session. The proposals laid out Monday are more apt for the Texas of three or four years ago, said Eva DeLuna Castro, a budget expert with the group. "We’re trying to write a budget for 2014 and 2015, and this comes nowhere near what’s needed to fix our schools, ensure access to health care and do something about congestion on our roads — the basic things," Castro said. The differences in both budgets are a mix of competing calculations about the growth in certain state programs. Lt. Gov. David Dewhurst noted that a full $400 million of the smaller size of the Senate budget is a result of how the two chambers are estimating growth in Medicaid enrollment. The Senate’s budget is based on August 2013 enrollment, while the House's is based on the August 2015 enrollment levels. Dewhurst said senators would update their numbers throughout the session as more data became available. Both budgets freeze funding for the Cancer Prevention and Research Institute of Texas, or CPRIT, Foundation which has drawn widespread criticism for charges of cronyism in relation to rewarding of some grants. The Texas attorney general, Travis County district attorney and state auditor’s office are all investigating whether the agency broke the law in their distribution of grant funds. Dewhurst predicted that lawmakers would pass measures to reform the agency this session “so that the full confidence and the trust of the Texas people is behind this noble pursuit.” He did not rule out restoring the agency’s funding over the course of the budget process. Both budgets dispense with the practice of using billions of dollars collected largely from fees levied on Texans and stockpiled in different accounts known as the state’s dedicated funds. Various lawmakers, including Gov. Rick Perry, have spoken in recent months about unwinding this practice. Williams said lawmakers likely can’t afford to undo their use of dedicated funds completely this session. “My suspicion is it’s going to take two or three sessions to bring that in for a landing where we don’t rely on that, but a good start is to begin with a budget that doesn’t rely on the [General Revenue] Dedicated balances,” Williams said. Before they can pass the next two year budget, lawmakers must pass a supplemental budget addressing more than $6 billion in unpaid bills left over from the last session.